Our day-to-day at ContactMonkey revolves around figuring out the biggest pains troubling internal communicators around the world. We hear stories of disengaged employees, unopened emails, and broken HTML emails in Outlook. With recent feature updates we’ve addressed all of those, but there are some pain points that kept popping up: employee surveys, team feedback, and real-time actionable data. With our new dashboard that incorporates the results from new features like social reactions and pulse surveys, we help you overcome those pain points. Let’s see how. We want to help you increase employee engagement while proving the value of internal comms with powerful analytics — all without leaving your inbox. That’s why we’ve been working on a new dashboard to make the tools you already love even more powerful and insightful. The new Dashboard is available on our Internal Communications plan. Not signed up? Get your free demo! Identify engaged and disengaged branches, departments or teams on a global level with our new geolocation engagement map. It’s now easier than ever to share data and reports from your campaigns with the rest of your team. Let the whole company know about your team’s success! See in real time engagement rates for opens and clicks for any of your email campaigns. Quickly see the open rates for desktop and mobile to really learn where your audience is consuming your content. Ready to see your powerful new dashboard? Book your spot and we’ll give you a tour. With these new features for Outlook now you can add social reactions, pulse surveys, and like buttons to the content in your internal emails by simply dragging the respective block anywhere you want in a pre-built or new HTML template. You’ll find these blocks in your email template builder that is part of ContactMonkey for Internal Comms. 1) Open your Email Template Builder and choose a template: from the ContactMonkey ribbon in Outlook, click on “Design HTML” and your email template builder will pop up. Select from dozens of pre-designed templates or upload your existing responsive HTML email designs to get started. 2) Design your template: Use our simple drag-and-drop email template builder to customize your designs to match your companies brand colours, messaging and imagery style. 3) Add social reactions! By simply dragging and dropping a content block with social reactions anywhere in your email, you’ll give your employees the ability to really let you know how they feel about your campaigns, your content, or any other importance announcements. 4) Add pulse surveys: With pulse surveys you’ll also get actionable data in real-time without having to ask in a formal, unengaging way. In your email template builder simply drag and drop a 5-star rating, a thumbs up and down, or a Yes/No question anywhere in your template depending on your question. The questions you’ll be asking are fully responsive (like everything in your template builder) and the responses you’ll be getting would either be in a five point or a two point scale. Very powerful data depending on your needs. 5) Add Like Buttons: add a “Like” button to any piece of content in your internal emails to easily gather data from your team. Once you’re happy with everything, hit send and and start getting feedback. To encourage participation and honest feedback, all results from social reactions, surveys, and like buttons are anonymous. So we’ve shown you how, but why do you think it’s important to gather employee feedback? With your ContactMonkey tool for internal comms, you can already see email opens, clicks, devices and locations on an aggregate or individual basis. This shows you a picture of how many and by how much. However, just opens and clicks don’t show you if your content is actually effective or how your team at large feels about it. You can (and should) use the results from social reactions and pulse surveys to improve your comms based on the feedback employees give you. It’s that easy. Nothing is more important for an internal communicator than feedback. Using our pulse survey tool you can add a simple survey questions and have employees directly give you feedback from within that email. No extra steps, no extra tools. It literally takes less than 5 seconds! For example, by simply adding a Yes/No response block you can immediately gauge if people understood or agreed with the message you just sent out. If your main communication tool (email, of course) is a one way, broadcasting system your employees will ignore you because a) no one wants to interact if they feel they’re not being heard and b) all the other technology they’re already using is allowing them to react and give their input. 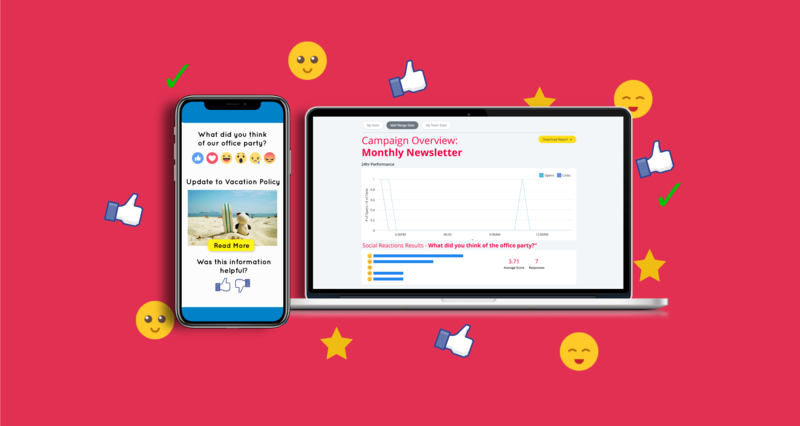 With social reactions and pulse surveys you’ll be taking the technology they already love outside the office–social reactions on Facebook, favorites on Twitter, a “like” on LinkedIn–and bringing it to the workplace. Your employees are already used to giving feedback everywhere else in their digital lives — why should your internal emails be an exception? Want to start sending interactive emails and take the pain out of gathering employee feedback? Simply book a demo and we will should you how you can leverage pulse surveys, social reactions and internal email tracking to boost employee engagement and prove the value of internal comms today.